If we had to characterise Christmas with one word, this word would be 'lyrical'. This quality constantly recurs in the polyphonic music that composers and church musicians of great fame and reputation have written for Christmas over the centuries. This is true above all in the Christmas music written for organ - the church music instrument par excellence. The selection here presented covers a period of two and a half centuries, from Sweelinck (1562-1621) and John Bull (1563-1626) to Johann Sebastian Bach (1685-1750) and perfectly fits the instrument. The Van Peteghem Organ in Haringe (Flanders) was built in 1778 and has, uniquely, been preserved intact as a rococo instrument. 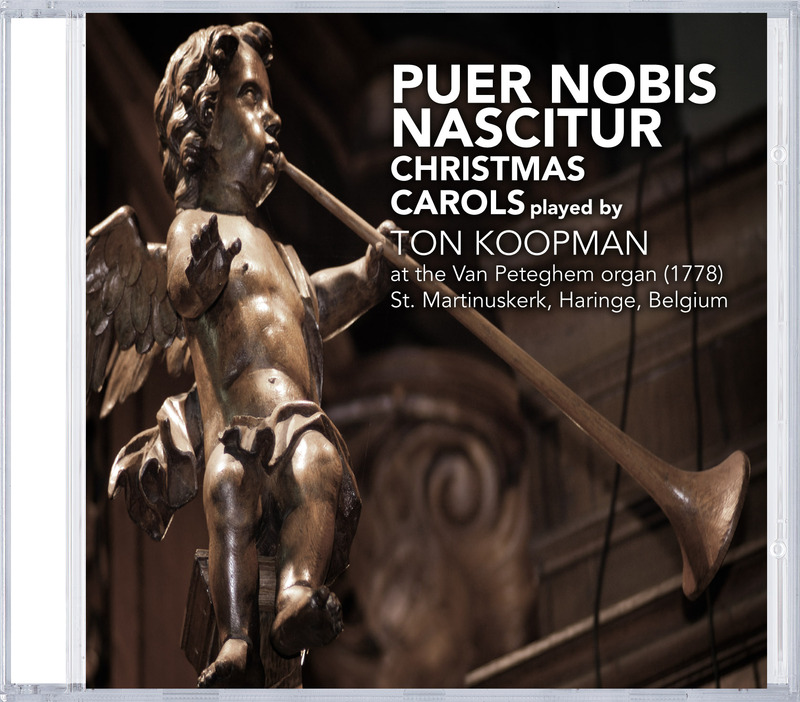 It is the climax of organ-building artistry of the Van Peteghem family, who enriched the Flemish organ scene with the best instruments of their kind and era. The Haringe organ is undoubtedly the best-preserved instrument from that period. It has never been rebuilt and its registers were never modernised in accordance with the prevailing tastes of intervening periods. Moreover, it has a wide- ranging and extremely varied disposition. The combination of all these elements makes this organ unique among Flemish historical organs, a fact that is recognised and appreciated by organists and organ lovers throughout the world. Between 1993 and 1994 the organ was restored by J.P. Draps and G. Potvlieghe under the supervision of the Belgian Department for Conservation. Ton Koopman (1944) studied organ (Simon C. Jansen), harpsichord (Gustav Leonhardt) and musicology in Amsterdam and was awarded the Prix d'Excellence for both instruments. As an organist he has performed on the most prestigious historical instruments of Europe, and as a harpsichord player and conductor of his Amsterdam Baroque Orchestra (founded 1979) & Choir (1993) he has been a regular guest at venues which include the Concertgebouw in Amsterdam, the Theatre des Champs-Elysées in Paris, the Philharmonie in Munich, the Alte Oper in Frankfurt, the Lincoln Center in New York, and leading concert halls in Vienna, London, Berlin, Brussels, Sydney, Melbourne, Madrid, Rome, Salzburg, Tokyo and Osaka. Ton Koopman edited the complete Handel Organ Concertos for Breitkopf & Härtel and will edit a number of Buxtehude works for Carus Verlag. He is president of the International Dieterich Buxtehude Society. He recorded a.o. for Erato, Teldec, Sony, Philips and DGG. In 2003 he created Antoine Marchand, his own sub-label of Challenge Records. Here he publishes the Complete Bach Cantatas, as well as his other recent and future recordings, including a Complete Buxtehude project.